Home > GOLD, Precious Metals	> Why Has Gold Been Down? Why Has Gold Been Down? In spite of some short-term fixes, there remains no real resolution to the sovereign debt issues in many European countries. We’re certainly not spending less money in the US, and now we’re bailing out Europe via currency swaps with the European Central Bank. Shouldn’t gold be rising? Yes, but nothing happens in a vacuum. There are some simple explanations as to why gold remains in a funk. The MF Global bankruptcy, the seventh-largest in US history, forced a high degree of liquidation of commodities futures contracts, including gold. Many institutional investors had to sell whether they wanted to or not. This is similar to why big declines in the stock market can force funds and other large investors to sell some gold to raise cash for margin calls or meet redemption requests. The dollar has been rising. Money fleeing the Eurozone has to go somewhere, and some of it is heading into US bonds, which means first converting the foreign currency into dollars. It’s tax-loss selling season, something that’s also impacting gold stocks. Funds and individual investors are selling underwater positions for tax purposes. Funds also sell their big winners to lock in gains for the year and dress up quarterly reports. These forces have all acted to depress the gold price. Notice I didn’t say that gold has suddenly become viewed as a poor safe haven. Nor that many of the world’s major currencies are no longer being debased… nor that global sovereign debt issues are resolved… nor that interest rates are positive. No, the fundamental reasons for owning gold are still intact. So don’t let the selling depress you. Let’s put gold’s recent price action into perspective. It peaked on September 5 at $1,895 (London PM Fix) and has thus been in decline for about three months. Yet look at the bull market’s biggest three-month correction in relationship to the ultimate trend. Gold fell 20% from August 1 to October 31, 2008, the biggest rolling three-month decline in our current bull market. And yet, it eventually powered much higher, in spite of many investors and industry experts thinking it had peaked at the time. The final quarter of 2011 ended down 5.5% over the previous quarter. The point? Don’t confuse short-term volatility with long-term forces. The investor who looks only at today’s headlines is prone to making ill-timed decisions. I realize that prices could trade lower – but this is why we keep a high level of cash. By the time this bull market is over, our current pullback will probably look something like the small red box in the chart above, with far higher prices in the intervening months and years. Which makes current prices a buying opportunity. I don’t know if we’re at the bottom of our recent decline or not – but I do know where gold and silver are ultimately headed Casey Research’s Chief Economist and Editor of The Casey Report, Bud Conrad, is convinced gold will hit $2,000 in the first half of this year. If he is right, the opportunity to buy at today’s levels will be fleeting. In the meantime, stay the course with your precious metals investments, no matter how the short-term picture looks. 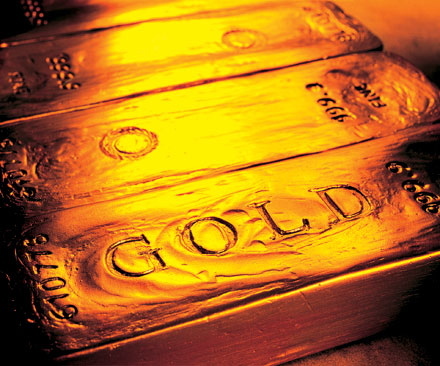 Gold stocks remain undervalued, and these are turbulent times. They appear to be far from over. Gold remains the #1 asset protector.